The research project ‘Augmenting Masterpieces’ was nominated for a ‘Best of the Web’ award, in the categories ‘Museum professional’ and ‘Innovative/Experimental’. The awards are presented each year for new web projects focused on museums. University of Amsterdam (UvA) researcher Johanna Barnbeck analysed the visitor’s experience in the Rijksmuseum for ‘Augmenting Masterpieces’. She also looked at how the interaction between visitor and museum could be enhanced through the use of a museum app. The project is innovative in its use of location-based technology for social purposes. Barnbeck first examined the visitor’s experience of both children and adults. Giving children a point-of-view camera, Barnbeck was able to experience the museum through their eyes. The camera images and completed questionnaires of adult visitors revealed an appreciation for the social dimension of the museum: visitors don’t just want to ‘look at art’, but also share their experiences with others. Working with these research results, Barnbeck created a museum app for generating more social interaction that does not rely on the individual visitor’s ‘cultural capital’. Visitors tested the app on an iPad and were given three options for greater social interaction with the museum and other visitors. The parrot from ‘De menagerie’, Melchior d’Hondecoeter, ca. 1660. One of the options is ‘Hide A Story’, where visitors go hunting for ‘treasures’: stories that previous visitors left near paintings. One visitor spotted in a painting green budgies that also fly around his back garden at home in Amsterdam. His recorded story gives the painting an ‘augmented’ layer that other visitors can then listen to when close to the painting. The app offered another two options for interaction. ‘Trivia Questions’ let visitors offer answers to questions about works of art and then compare their answers to those of other visitors. ‘Improve the Museum’ allowed visitors to leave feedback for the Rijksmuseum whenever they came across incomplete information about works of art. The museum app is not yet generally available. The prototypes were presented to the Rijksmuseum in January and work is currently ongoing to roll out the app in due course. The ‘Best of the Web’ awards will be presented at the Museums and the Web conference from 8 to 11 April 2015. Barnbeck will be holding a workshop at the conference on her methods and design thinking for museums. 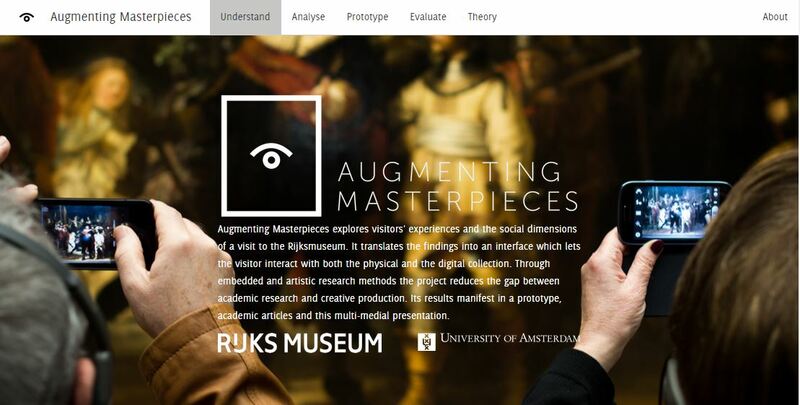 ‘Augmenting Masterpieces’ is a collaborative project between the UvA’s Faculty of Humanities, the Rijksmuseum and companies in the creative sector. The project is part of the Centre for Digital Humanities and of the project Coding the Humanities. Aim of the project is to contribute to the debate on how best to use new technologies in museums, brings scientific research, an interdisciplinary research method and the creative practice closer together. Johanna Barnbeck has been involved with the project as an embedded researcher over the past year. She did the Research Master’s in Artistic Research and Cultural Analysis at the UvA. The project was coordinated by Jan Hein Hoogstad (assistant professor of Cultural Analysis at the UvA) and Shailoh Phillips (formerly of the Rijksmuseum Medialab).